The Shiba Inu is one of six native Japanese dogs that in Japan are classified by size because they are so similar in type. The Akita Inu is the only large breed and the Shiba the small. The last four are medium, Kai Ken, Hokkaido Inu, Kishu Ken, and Shikoku Inu. There are several theories regarding their name, the first being that it is an old Japanese word for “small”. A second popular opinion is that it is derived from the word shibafu, meaning “patch of grass”. 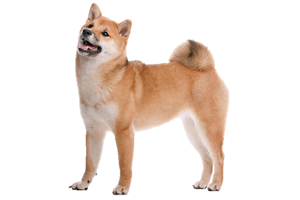 Traditionally the Shiba Inu was used to hunt boar and deer in packs, pairs, or singly. As large game disappeared from the islands it adapted to smaller animals and ground birds. With the invent of guns and the rise in bird hunting the Shiba Inu became adept at flushing and working as a bird dog. Thought to be one of the oldest breeds of dog, bones matching the Shiba Inu have been found at an archaeological site from the Jomon period. This dates them back to at least 500 BC. By the 7th century they were well established within Japanese culture. Unlike the other native breeds, Shiba Inus were found throughout the country. This meant there were dozens of local varieties through the centuries. By the 1920s the influx of imported breeds had decreased the numbers of all the native Japanese dogs that they were on the brink of extinction. Hunters and breeders planned a survival program and in 1937 the Shiba Inu was declared a Natural Monument. Barely surviving the ravages of WWII, the breed suffered further when a distemper outbreak killed most of the remaining lines. At the time three local varieties still existed. The Shinshu Shiba from the Nagano prefecture, the Mino Shiba from the Gifu prefecture, and the San'in Shiba in the northeast region. By then few Mino and San’in remained. Those that survived were located in remote regions. They were combined with the remaining Shinshu to create the modern dogs we know today. Is the Shiba Inu Right for You?